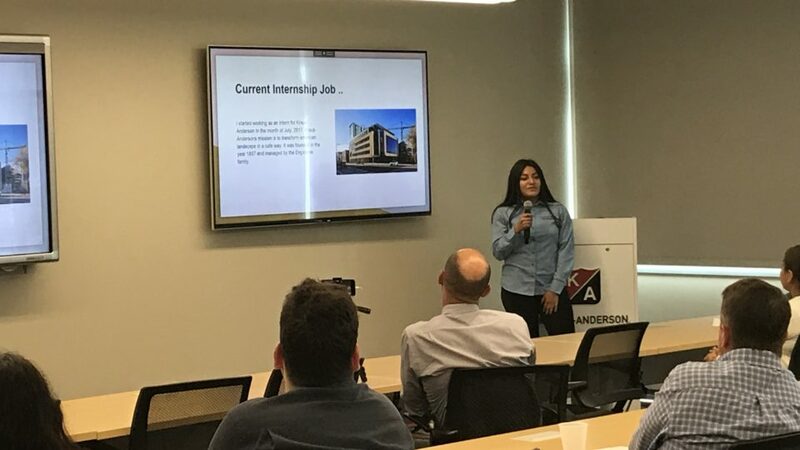 Most teenagers and young adults experience their first internship in college, but the students of Cristo Rey Jesuit High School start in their freshman year of high school. Part of the nationwide network of Cristo Rey’s Jesuit high schools, the school provides rigorous, college preparatory educations to students in urban communities with limited educational options. 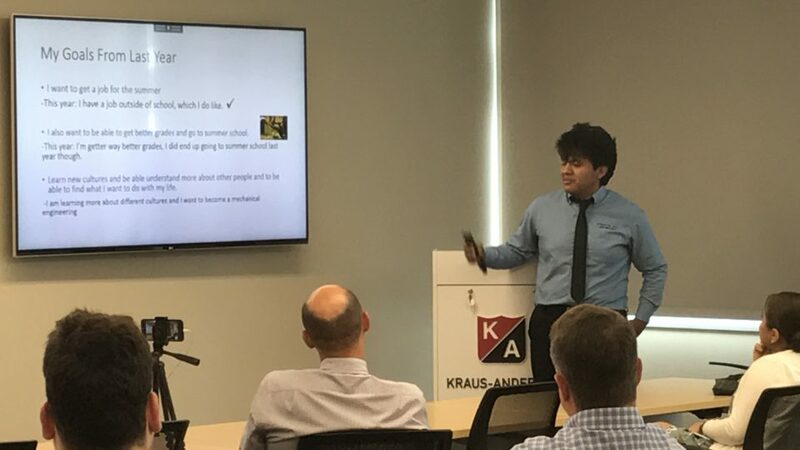 Kraus-Anderson employs four Cristo Rey interns through the school’s Corporate Work Study Program (CWSP), which requires each student to work five full days per month in a professional work environment. Alexander, Yanelis, Brian and Tania job share at KA, each working one day of the week and taking turns working the fifth day. Working funds over half the cost of the students’ education, helps develop professional skills and provides them with valuable experience working in a corporate setting. The students learn responsibility, gain confidence and explore possible career interests. The school’s innovative focus on both professional work and academic excellence leads to success. Since the Minneapolis school opened in 2007, Cristo Rey has established a 96% student retention rate. The first graduating senior class had a 100% acceptance rate into college or a military program, which they have continued the tradition through the 2018 graduating class. Learn more about becoming a corporate partner. KA recently celebrated the graduation of Alexander, who will be attending St. Cloud State in the fall of 2018. Daily Tasks and activities? Getting the mail carts, putting my food away, and asking for a project. Job highlights/favorite projects? The people are all fun, really my favorite projects is anything that involves organizing items. What has working at KA taught you? To be patient, to not get frustrated easily, and working with different types of people. Have you met any influential people at KA? Lori Charlesworth and Linda Bolin-Schauer, both have given me good advice for the future. How is Cristo Rey different from your previous school experience? 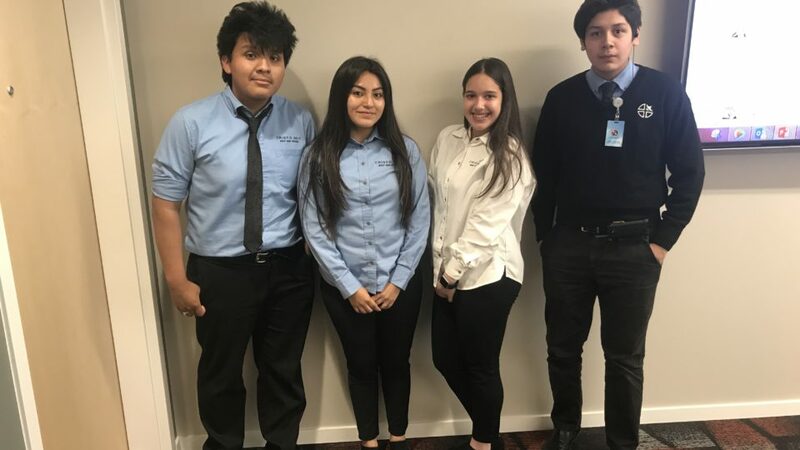 : Cristo Rey is different from my previous schools since people in my old school were always going into their own group, while In Cristo Rey, people aren’t afraid to talk to one another and there are really not any groups. Favorite School Subjects? Economics/Government, English, and Art. Educational and Career Goals/Interests? Mechanical engineer or working with animals. Something we might not know about you? I stop the microwave before it rings, I like stuff from Japan, I am afraid of heights (sometimes). Hobbies and Interests? Reading, walking, listing to music, video games, and organizing. Daily Tasks and activities? Daily tasks consists of mail carts, UPS, laminating, lien waivers & binding. What has working at KA taught you? Working at KA has taught me to ask more questions, be more independent, be more confident, and to work on improving my communication skills. How is Cristo Rey different from your previous school experience? Cristo Rey is different from my other school because they challenge you to exceed at your full capacity, it helps you with time management and gives you the opportunity to be in a professional environment that teaches you basic professional skills. Favorite School subject? English and Physical Education. Career Goals/ Interests? Immigration Lawyer/ Criminal law. Hobbies/ Interests? Soccer and Softball. Daily Tasks and activities? I collect and deliver the mail carts and assist with postage. I also do projects such as MUR’s (Monthly Utilization Reports, tracking workforce participation), subs on site reports, and assist with payroll. Job highlights/favorite projects? My favorite projects are the MUR’s and payroll because they teach me how to keep organized. What has working at KA taught you? Working at KA has taught me how to be less timid when speaking in front of a group of people. Favorite School Subjects? My favorite subjects are Math and Physics. Educational and Career Goals/Interests? I would like to become a doctor or an engineer; or be involved with computer science. Something we might not know about you? I have a 3.9 GPA and I really enjoy school and learning. Hobbies and Interests? Some of my hobbies are reading and playing video games. Daily Tasks and activities? First thing I do is bring down all the mail carts and when I don’t have other tasks I help Kathy and Jackie open, stamp and file the mail. Then I usually make package deliveries throughout the building. I ask Linda for projects or if she needs help on something and it usually consists of binding, setting up workrooms, putting food away, cleaning, making sure there’s supplies in each workroom, scanning, etc. (basically anything that needs to get done.) If she doesn’t have anything I usually help out other people in the building with projects they need help with. At the end of the day I clean all coffee stations. I clean the pots and wipe down the entire counter. I have to make sure each floor’s coffee station is clean including the executive office and the cafeteria. When I finish I wait for Brenden to bring down the mail, which I then seal and stamp so it is ready to go out as well with the UPS. I make the labels and do them as precisely as I can so they go to their right destination. Job highlights/favorite projects? I mostly like all projects I have been given because it keeps me occupied and it’s a hands-on learning experience so I don’t mind if its filing, scanning, binding, labeling, cutting, etc. What has working at KA taught you? Working at KA has helped me be more responsible and mature a little bit more. How is Cristo Rey different from your previous school? I transferred to Cristo Rey my sophomore year. My freshmen year I attended a public school in Columbia Heights. My experience at Cristo Rey is way different from my previous school experience. Cristo Rey pushes us to do our best. Teachers work individually with us to make sure we understand what we’re doing to succeed. The school I attended my freshman year wouldn’t expect me to strive for my best. Cristo Rey also allows us to gain work experience so later in the future we don’t struggle with that. Something we might not know about you? I will be a first Generation Graduate, meaning I will be the first one to graduate high school and attend college from my family. I have three siblings. A twin brother, 12 year old sister and the youngest one is three years old.